You can do whatever you want. There is no limit to human beings, provided they believe so. 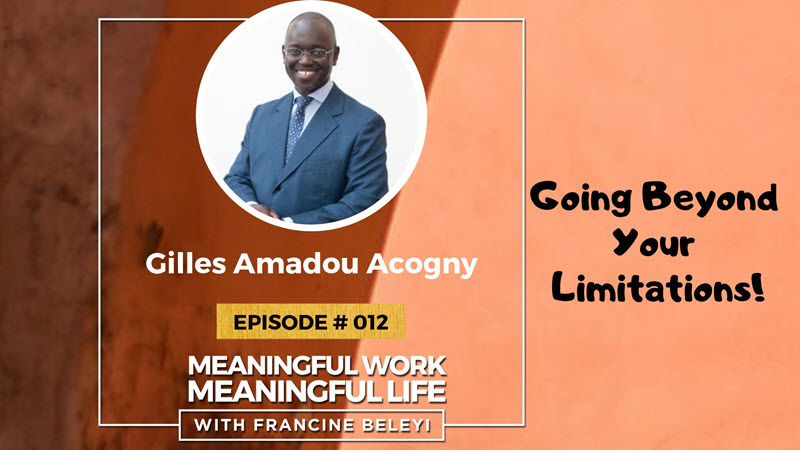 Today I am excited to discuss with Gilles Amadou Acogny, Co-Founder & CEO Acosphere, a London based firm that delivers consultancy and transformational Training. Gilles manages the company with his wife Nadia Mensah Acogny who was on the show in the episode 11. Gilles focusses on leadership, general management and vision in the business. He tells me how having clear rules allow them to function well and challenge each other to think outside the box. He talks about why he decided to leave his high-flying job in sales at Xerox to invest everything into his own business and how he convinced his wife, Nadia, to start the business with him after she initially saying no. We also discussed his previous career and how he became one of the top executives in the companies he worked for and turn them around significantly. Gilles believes in the transformative power of public speaking and wish he knew this way earlier. You will find this conversation very rich and inspiring as he shares great insights and practical tips to do meaningful work and leave a meaningful life! The impact of his childhood and travels living on three continents and how he developed his sales acumen by understanding cultures and people. Now, listen to this stimulating conversation with Gilles Amadou Acogny. Read spiritual books on Buddhism, Christianity, Islam regardless of your religion. Thank you once again Francine ! It was such a pleasure to have this conversation. So enlightening. Keep up the good work.